At MyNutrition MyLife™ in addition to medical history, dietary and lifestyle assessment, reviewing medical labs, we also offer functional lab tests as well. Functional lab test uses cutting edge technology to determine your nutritional status compared to conventional lab testing. How Do Specific Nutrients Function in the Body and What is the Result of Deficiency? How do I get Micronutrient Testing? Labs are available to all current clients. If you are a potential client and are interested in doing a Micronutrient Panel you can book your initial session and pre-pay for this lab. We can arrange a blood draw prior to your consultation to ensure we will have the results to review. Standard test results do not measure if the nutrient is properly functioning within the body. SpectraCell Laboratories developed their exclusive, patented micronutrient tests to measure the function of selected vitamins, minerals, antioxidants and other essential micronutrients within your cells. Analysis can reveal a person’s functional nutrient status over a longer time period than conventional serum testing. SpectraCell’s tests give a more meaningful measurement of nutritional status than all other nutritional testing available on the market. 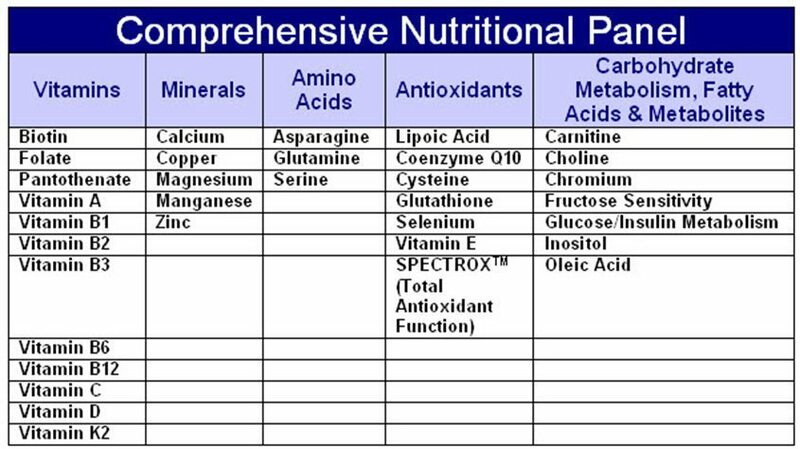 Absorption: Although you may eat a balanced diet, if you do not absorb micronutrients properly – such as vitamins, minerals and antioxidants -you will have deficiencies.